What makes porcelain veneers durable? What makes veneers an adequate substitute for lost dental tooth structure? On this page, we are going to discuss the findings of numerous scientific publications that shed light on a plethora of aspects that contribute to an adequate replacement of missing or unaesthetic tooth structure. Each of the following discussed aspects of replacement of tooth structure with porcelain veneers contributes to the overall quality and value of the tooth restoration. Before any treatment can be rendered, the basic health of the oral cavity and the masticatory system needs to be ascertained. This includes possible disease of the gums and mucous membranes, caries of individual teeth, excessive wear of tooth structure, or problems with the structures and function of the temporomandibular joints and their chewing muscles. Every person presents with an individual functional scheme that may be considered within the limits of "normal" function. A "normal" state is usually indicated by the absence of any excessive wear or mobility of teeth, healthy temporomandibular joints, and the absense of any pain or parafunctional habits within the neuromuscular apparatus of the chewing system. Both conditions can be caused by prior dental treatment, such as orthodontic constriction of the dental arches, which may lead to a "trapped" lower dental arch that may need more freedom to function within its physiological neurological schemes, or dental restorations, such as crowns or fillings, that may contact the opposing dental arch earlier than the remaining teeth. This may initiate a sequence of events that lead from muscular hyperactivity to a misalignment of the temporomandibular joints. This may eventually lead to pain anywhere in the chewing system, articular derangement, and/or excessive wear of teeth, which equals a premature aging of the dental arches. A high percentage of patients who come in for cosmetic dentistry actually complain about the premature aging that masticatory dysfunction may have caused. It is evident that the simple placement of porcelain veneers to replace missing tooth structure will not be successful, since established neuromuscular patterns will cause a rapid deterioration and/or failure of the new porcelain restorations due to the excessive load and direction of the force vectors on the functional slopes of the veneers. Once a harmonious relationship between jaws and bite closure have been established, it is paramount to test the "smile rejuvenation" by designing a mock-up within the harmonious functional paths of jaws and teeth. 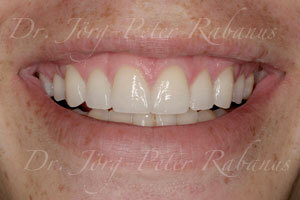 This is commonly achieved with a diagnostic wax-up on properly mounted and related dental models. It entails an even distribution of forces on all teeth involved. The wax-up design can now be transferred into the patient's mouth using PVS molds of the wax-up, allowing a duplication of the diagnostic model work in the patient's mouth. The "provisionals" allow the patient to experience how the rehabilitated smile would feel, look, and function. Changes can be made in the patient's mouth without the need of local anesthetics. The changes reflect functional fine tunings as well as patients' aesthetic desires as they are feasible with the functional framework. Once the smile rejuvenation has been perfected, matrices are made from the approved provisionals, which will be used to determine the minimally required reduction of tooth structure, which is dictated by the manufacturers instructions as well as the treatment goals. We placed a series of videos on YouTube that explains all aspects that determine the requirements of tooth reduction for porcelain veneers. Lack of equal-intensity holding contacts that distribute forces equally throughout the mouth. Disregard of natural functional pathways that are inherent to the patient's neuromuscular pattern. Overload of veneers that interfere with the physiological neuromuscular pattern of the individual patient, leading to fracture. Lack of immediate discussion of the posterior teeth on the working and balancing sides when the mandible moves laterally. (see Williamson and Lunquist, J Prosthetic Dentistry 1983; 49(6): 816-823. The lingual contour of the maxillary canines must be steeper than the posterior morphology, i.e. the morphology of the back teeth, but NOT too steep. We therefore use provisional restorations that incorporate a customized anterior guidance. It is best to record and copy the lingual pathways of the pre-existing dentition. They are the pathways that the patient "created." They should be preserved by a customized incisal guide table. The lingual contour of the upper incisors needs to be steeper than the posterior teeth without restricting movement of the mandible. This is the most challenging aspect of any smile makeover or dental/oral rehabilitation/rejuvenation. A cosmetic dentist is well advised to spend most of his/her treatment planning on this step. One should attempt to establish equal contacts of the leading edges of the lower incisors from initial contact with the new lingual surfaces of the upper incisors all the way up to their incisal edges. Lateral incisors break most frequently because it is often overseen to develop a smooth transition on the path towards the incisal edges of the maxillary central incisors, as the lower canines move beyond the upper canines in lateral excursive movements. (see Darveniza M et al. Full occlusal protection - Theory and practice of occlusal therapy. Aust Dentistry J 2001; 46(2): 70-79. The lingual contour must be concave enough to be in harmony with the functional envelope of function of the mandible. Establishing centric relation (which is described on a seperate page on this website) as the home position of dental function often expands the horizontal freedom of the mandible. Improper preparation design with too little or too much reduction. 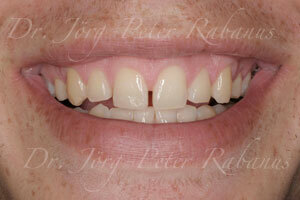 (see Sharma N. Clinical tips in full-veneer tooth preparation. I Indian Prosthodontic Soc 2007; 7(3): 137-142. Verma R. Simple Techniques of Tooth Preparation: A Step-by-Step Guide to Tooth Preparation. 1st ed. 2006: 195-222. Sharp line angles and rough preparations often lead to failure of porcelain restorations. Any internal line angle needs to be rounded according to the reduction guides that were created from the diagnostic wax-up. Meticulous adhesive technique is indispensable for a long-term prognosis of a bonded porcelain restoration. If bonded well following every detail of the manufacturer's instructions, the new porcelain restorations will be strong and durable. Find more information about the longevity of porcelain veneers.